I'm sorry I have been so quiet. We are moving in a couple of months and have a lot to do to get the house on the market. I haven't had much time to craft. D is for Don't Over Do it! 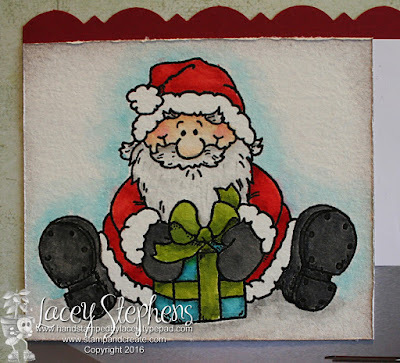 This is Santa's Gift from High Hopes Rubber Stamps. 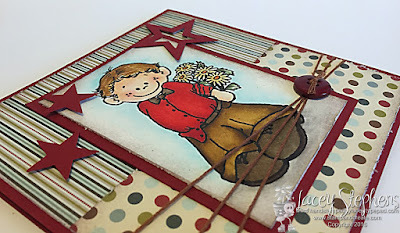 Just a quick card with a little Liquid Applique and Stickles glitter to finish it off. Now it's your turn! The challenge runs through March 1st. 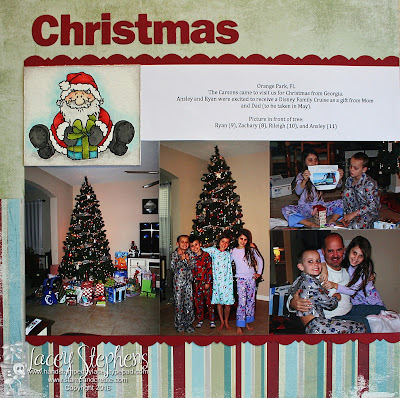 Today I'm sharing another Christmas scrapbook layout. 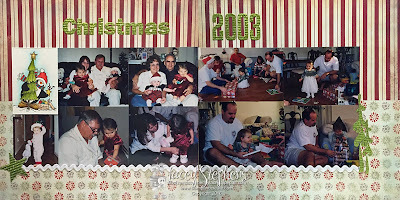 This one is from 2003 when my now 13 year old was only 15 months old (my how time flies). I used Getting Spruced Up S241 for this layout. 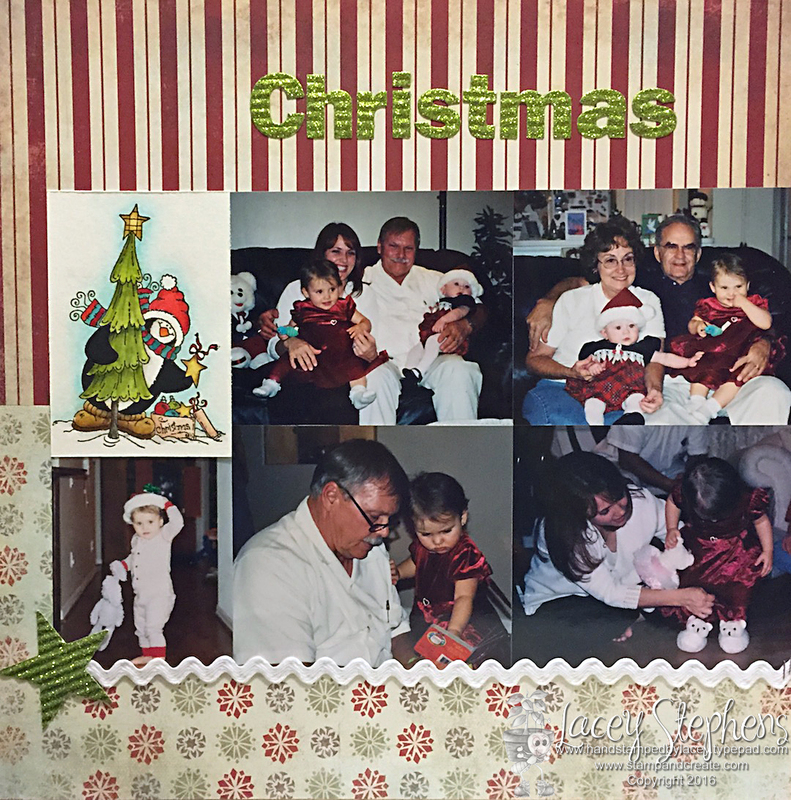 I kept it simple so that it fits nice and flat in a scrapbook. 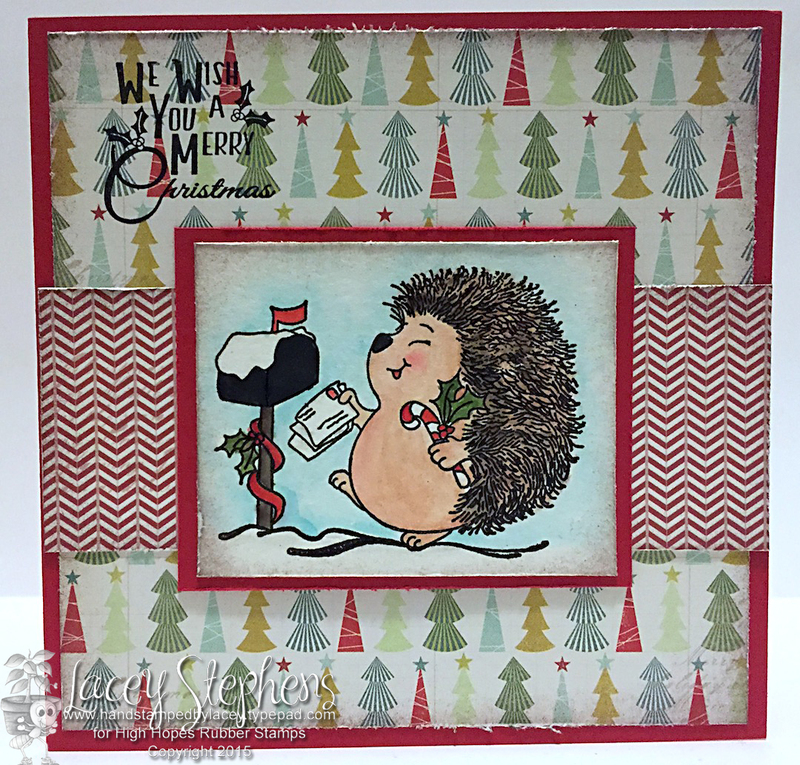 I used some die cuts to cut out the title from glitter card stock, a Star punch and spruce die, and ric rac ribbon to finish it off. I needed to get started on some Valentine's Day cards for the kids' teachers. This image is really cute for a Mother's Day card as well. The image was embossed in black onto watercolor paper and watercolored with Twinkling H2Os. Well it's back to the grind! My kids went back to school yesterday after their almost-3 week break. I love being home with them, but it is hard to get anything done. We had a great time together while they were on break and we are looking forward to a great year! I really need to get caught up on some scrapbook layouts. Hopefully I will be able to do more layouts more often. I miss it and I'm desperately behind! I had these pictures already printed out so I went with 2014 first (I don't think I have any Christmas layouts completed yet!! I have 13 years to catch up on!! Yikes! I decided to use Sitting Santa S203 for this layout. 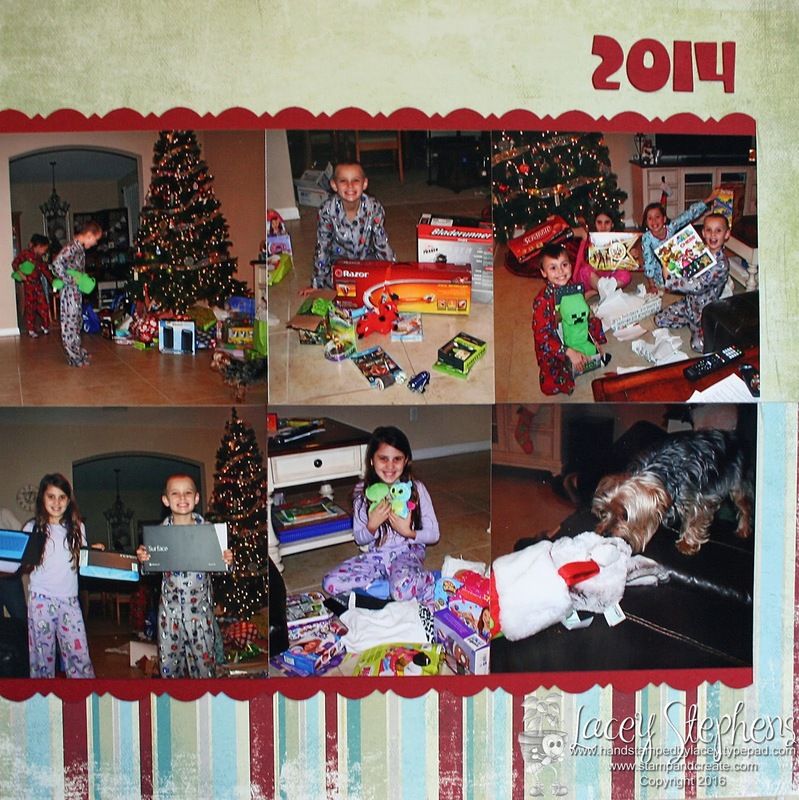 I hope you had a wonderful holiday. I'm sad that Christmas break is over. Some news, my husband has been offered a job in Atlanta, GA so we will be moving in June after school is out of the Summer. 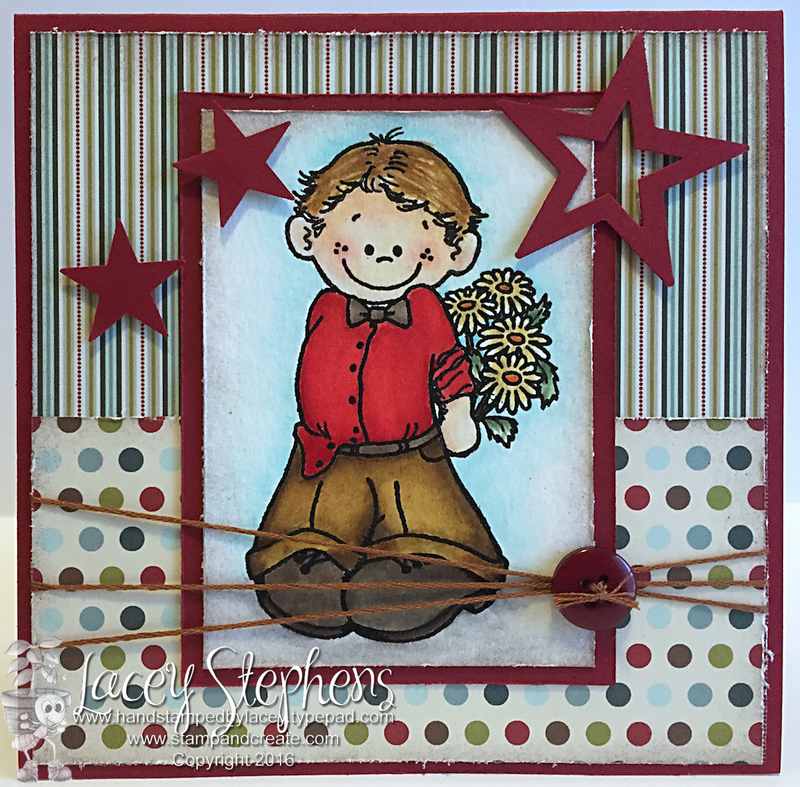 I am in the process of closing Stamp and Create. If you are looking for some great deals, check out the closing sale. Everything is 50%-60% off. I have started a new business making Rhinestone T-Shirts. Since the Stamp and Create website is not conducive for drop down menus, I am using Etsy to sell the T-Shirts. You can find my Etsy store Here. 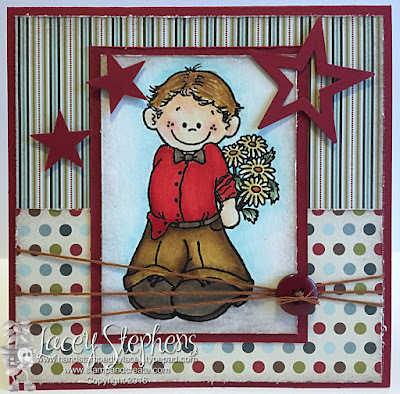 This is Ski Star Tilda from Magnolia. I wish you a very Safe and Happy New Year!!! 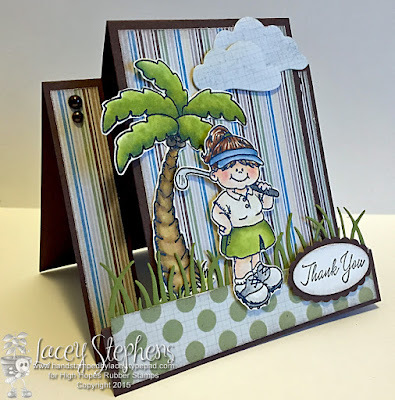 Today I created a Thank you card for a friend. 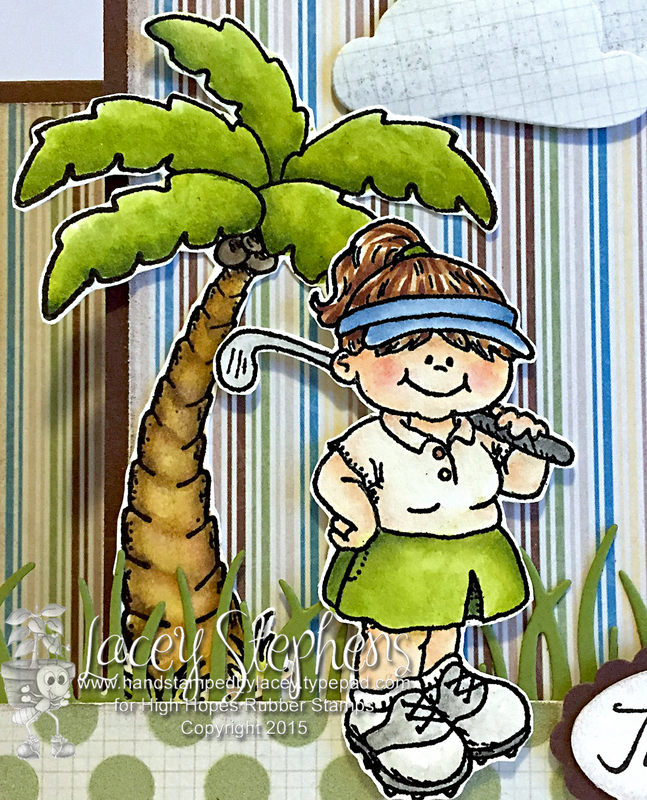 She loves to golf and we live in Florida so I paired these two stamps together to create a fun scene. 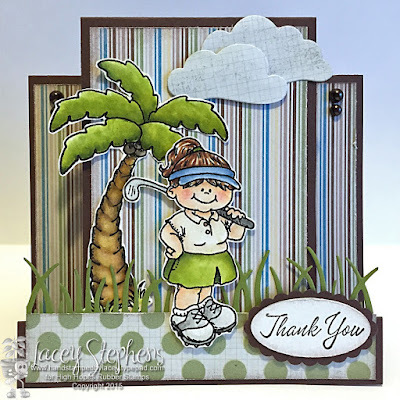 This is Swinging Sherry and Palm Tree S096. I created a Zig Zag Card (or a Center Step Card). 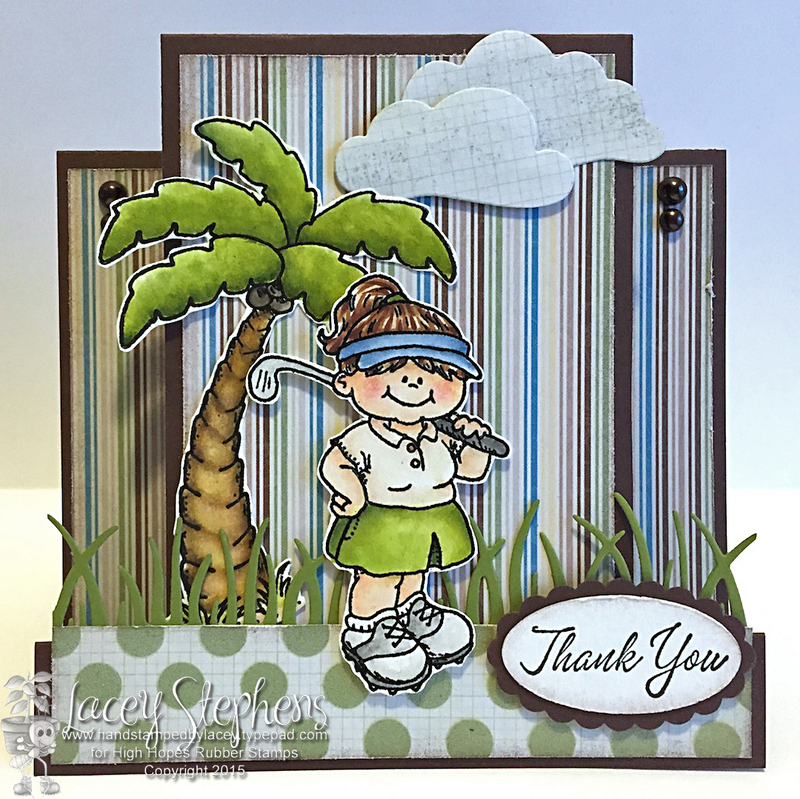 You can find a tutorial here created by Kristine. 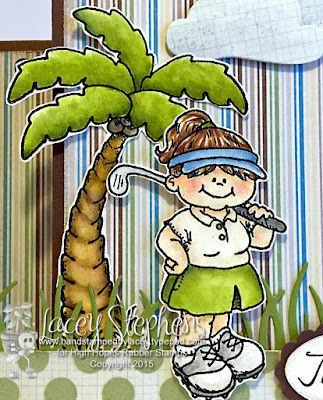 The image was embossed in black onto watercolor paper and watercolored with Twinkling H2Os then cut out and attached to the card. 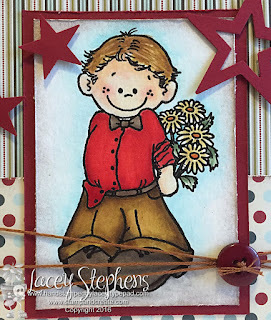 Happy stamping and I hope you have a very Happy New Year!! 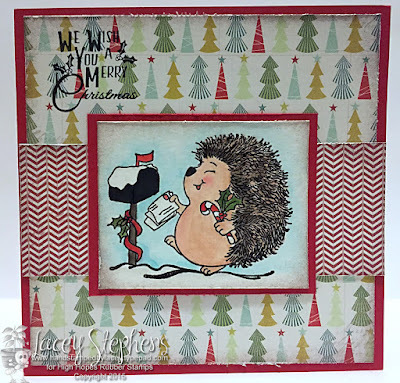 You can find the High Hopes December Challenge here. 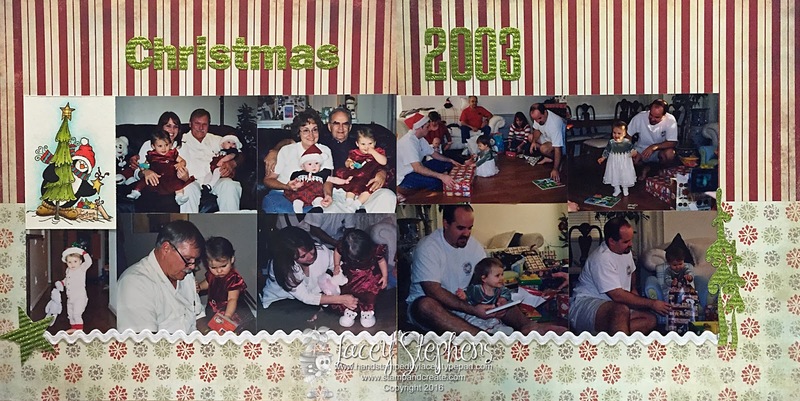 I pray you all are having a wonderful Christmas. 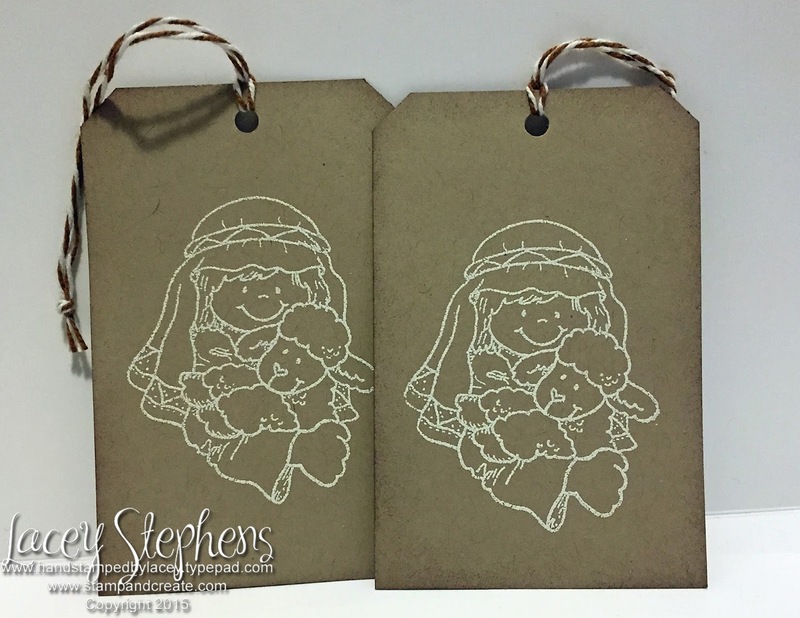 I needed a few tags so I pulled out this adorable stamp called His Love For Ewe M103. 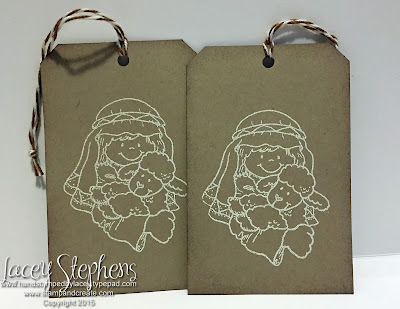 I just embossed the image in white onto Kraft cardstock, inked up around the edges in brown and then added some bakers twine. Easy peasy!!! Happy stamping and I hope you have a very Merry Christmas!! I hope you all are having a lovely Holiday. 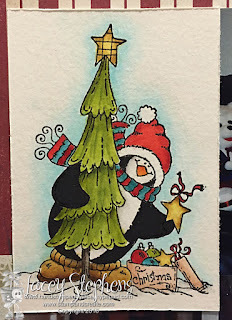 I can not believe that Christmas is just in 1 Week!!!! I am still not ready. In fact, I haven't even mailed my Christmas cards yet!! The papers are My Mind's Eye. The image was embossed in black onto watercolor paper and watercolored with Twinkling H2Os and Copics. Well, I'm sorry I missed my post last week. My husband was in the hospital with a blood clot. 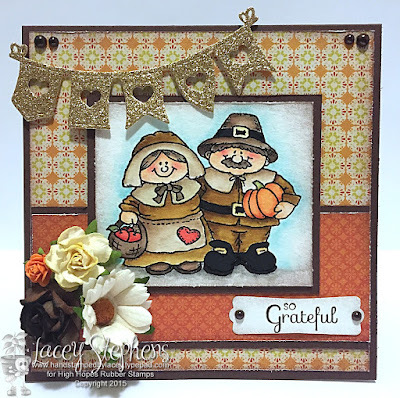 Luckily they found it early and a few days of hospital bed rest and blood thinners and he will be ok.
Today I'm sharing a card using an older image called Pilgrim Pair S209. Kate is a young little girl with a brain tumor. Please keep Kate and her family in your prayers. 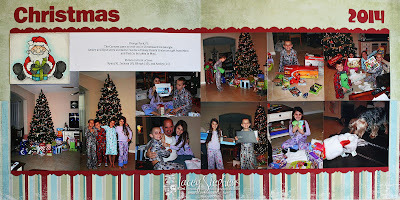 All photos and images on this blog are copywrited by Lacey Stephens and are not allowed to be reproduced without permission. Feel free to use my designs as inspirations, but do not use them for publication or entries into challenges.